February slipped quietly into Kauai bringing clear skies and gentle trade winds to the island. Probably due to a waning El Niño effect which typically brings clear crisp mornings and bright sunny days to our winter season. We all know that this weather enables Kauai homes for sale to present themselves majestically against verdant green landscapes. This is true for our most recent home that we placed in escrow in February 2016. Surrounded by colorful plumeria, croton, and coconut trees strategically placed on this flat 10 thousand square foot lot lies this plantation style home. Tucked behind a redwood gate this 864 square foot charmer is painted in a muted sky blue that conjures up cool breezy trades and quiet afternoons under the large canopied monkey pod tree in the backyard. The former sugar town of Kekaha on the western side of the island, has a storied past in the glory years of King Cane, when some of the highest sugar yields in the world were achieved here. No doubt due to the extraordinary year round climate of clear sunny days and cool nights. Kekaha, at sea level has an average rainfall of 12 inches per year but just 1000 feet in elevation the rainfall total triple. 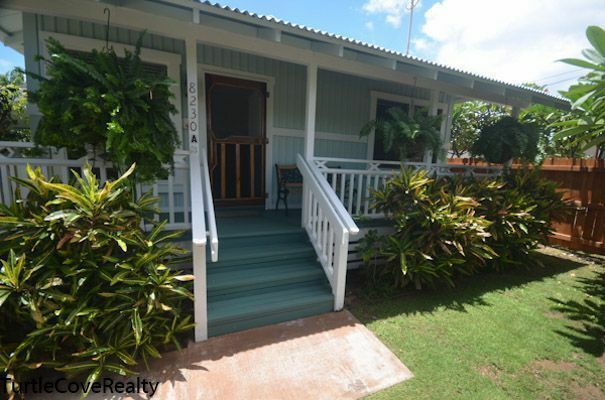 This home is situated only 100 yards from the ocean and the longest beach in the State of Hawaii. An ideal spot to take advantage of crisp ocean breezes and the sugary sands of Kekaha. Or if you crave wide open trails and dense jungle conditions the state park of Kokee is at the ready. With miles of trails, Kauai has more hiking trails than any of the other Hawaiian islands you can explore canyons and waterfalls on great Kauai hikes. Kekaha is a bird lovers paradise too. Many coastal seabirds call the Kawaiele Waterbird Sanctuary home. It’s located about 2 miles from the house on the way to Polihale Beach Park. Arrive an hour before sunset, bring a blanket and sit next to the shallow reservoirs created years ago by the plantation. The backyard with its spreading monkeypod tree cools the house and offers a resting area for local mynahs during the heat of the day. And for your beach toys there is a large permitted storage structure located in the back. Tell us about what you would like in a home on Kauai. Lee Morey PB and the staff at Coldwell Banker Turtle Cove Realty are experts in Kauai real estate and have successfully represented buyers and sellers in all types of real property transactions.